Popular actor, Mike Ezuruonye is a happy man right now, his debut movie as executive producer, Brother Jekwu has grossed over N20 million in 10 days. That is a new record by movies in cinemas in recent times. Brother Jekwu is a comedy film and Mike’s first movie as an executive producer. 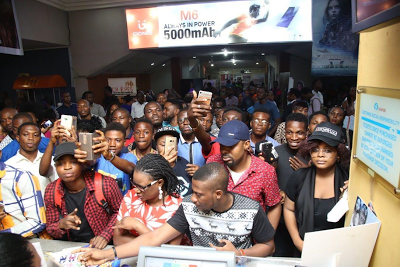 Meanwhile, last Sunday, Emoney, Kcee and other members of Five Star Music family were at Ikeja Cinema to see the movie. Emoney paid for 170 people at the cinema to see the movie and gave several gifts to people who couldn’t get enough of him. The bouncers had tough time controlling the crowd.